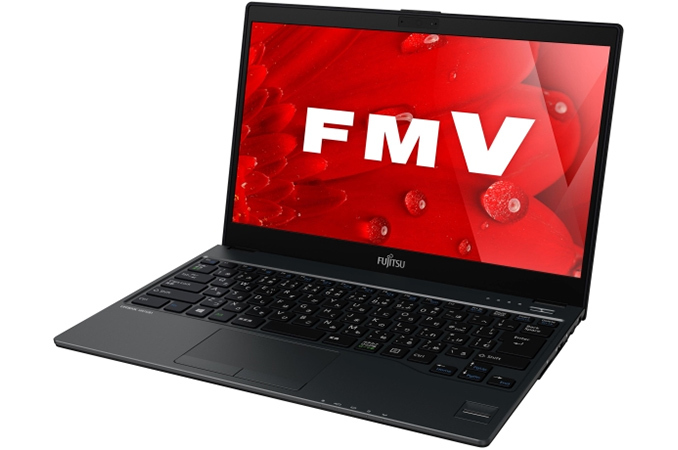 Fujitsu has introduced its new Lifebook U937/P notebook that weighs under 800 grams (1.76 lbs), but offers a fully-fledged Intel Core i5 Kaby Lake-U processor as well as a 13.3” display with FHD resolution. The notebook is designed for business users and thus comes with features like a fingerprint reader. Fujitsu did not announce many details about its Lifebook U937/P, but only said that the laptop is based on the 7th generation Intel Core processor (which, given the timing of the announcement, implies on the Kaby Lake-U), weighs less than 799 grams (1.76 lbs) in its default configuration, is 15.5 mm thick and comes in black or red. Despite the introduction, no real details other than those above were disclosed. Despite this, a lower weight notebook for the Japan market was also disclosed - the Lifebook UH75/B1. 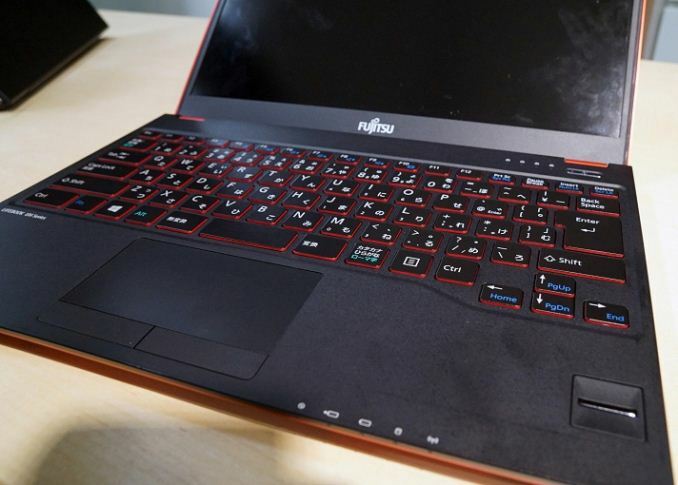 This is a lower-cost laptop, that is also 15.5 mm thick but weighs only 777 grams (1.71 lbs). Specifications of the Fujitsu Lifebook UH75/B1 will hardly exactly match specs of the Lifebook U937/P since the systems are priced differently, but they give an idea what to expect. The UH71/B1 notebook is based on the Intel Core i5-7200U (2C/4T, 2.5 GHz, HD Graphics 620) SoC and is equipped with 4 GB of DDR4-2133 memory (Ian: is that single channel?) as well as a 128 GB SSD. When it comes to input/output capabilities, the Lifebook UH75/B1 offers a 802.11ac Wi-Fi + BT 4.1 wireless module, three USB 3.0 ports (two Type-A, one Type-C), an SD card reader, an HDMI output, a TRRS audio connector, a webcam and a fingerprint reader. As for the battery, the notebook comes with a 25 Wh accumulator that can power it for eight hours. RAM 4 GB DDR4-2133 Probably 8GB+? Storage 128 GB SSD Probably 256GB+ ? Camera 720p webcam Maybe FHD? Battery 25 Wh 25 Wh? The Lifebook U937/P and the Lifebook UH75/B1 are among the lightest 13.3” laptops ever produced and will be among the lightest on the market. At the same time, it is noteworthy that the UH75/B1 only has 4 GB of memory and 128 GB of storage space, which is not a lot by today’s standards and may be considered not enough by many users on the go. By contrast, Samsung’s recently updated Notebook 9 weighs 816 grams, but comes with 8-16 GB of DDR4 and a 256 GB SSD. Moreover, Lenovo’s LaVie Z (introduced in 2015) not only had more memory and a larger SSD, but also a higher screen resolution. On the other hand, ultrathin and ultralight laptops are usually full of compromises because various people have different requirements and fulfilling requests of one group means introducing limitations for another. The one common feature through these is that the sub-1.8 lb laptop market is dominated mostly by entrants focusing on the Japanese market. Fujitsu plans to start selling the Lifebook UH75/B1 in Japan in mid-February for ¥190,000 (~$1660). ETA of the Lifebook U937/P is February, but we do not know whether it is early or late in the month. Meanwhile, the price of the product will be ¥284,900 (~$2486), which is considerably higher than the price of the UH75/B1 and implies on better specifications (e.g., a better SoC, more memory, a higher capacity SSD, etc.). Idiot proof is not superior. I know that people have a hard time thinking, and for many it is a challenge to figure which way the usb connector goes, but if we "solve" that, people will become even dumber absent those daily "challenges". The C port is not superior technologically, it doesn't offer higher transfer rates or latency, it is not physically stronger, nor less prone to damage. it is just fool-proof and over-hyped, with the latter being mostly due to the price premium for C type peripherals and cables to A type plus the actual need to either replace hardware or buy additional clunky adapters. The type c connector has greater durability 10000 mating cycles vs 1500 for type a), designed to scale well beyond 10Gb, and it's smaller. It also is designed for far greater versatility when paired with the pd 2 and alt modes. In the meantime, we'll have to deal with dongles, adaptors, and doohickeys. 1500 cycles isn't nothing - that's once a day for years. Furthermore, though I obviously haven't counted, several ancients phones friends still use (android 2 era) with batteries decrepit enough to require several loads a day have never once seen a port break through wear - so I'm not convinced that actual type A ports in current use actually have such a low endurance, despite the design aims. Your anecdotal experiences, keep in mind I was responding to specific claims from derived. Also, imho, people didn't fixate on the symmetry of type c, but the NEW features it brings. That's the big deal, and that's why I'm glad to see the manufacturers moving fairly quickly towards its adoption.